A Backyard Wedding Photographer NJ sees the heart and soul of New Jersey. Having a wedding ceremony in the backyard keeps a day that can often become overwhelming very simple. A backyard wedding also can cut down on wedding costs and is a much more personal experience. A backyard wedding gives couples a myriad of choices when it comes to how they would like their day to look and feel. The bride and groom also have complete control over how much they spend and what they choose to spend a little extra money on. These factors take some of the stresses away that may come with planning wedding ceremony and reception. Backyard weddings typically are a bit smaller, giving the event a much more intimate feel. 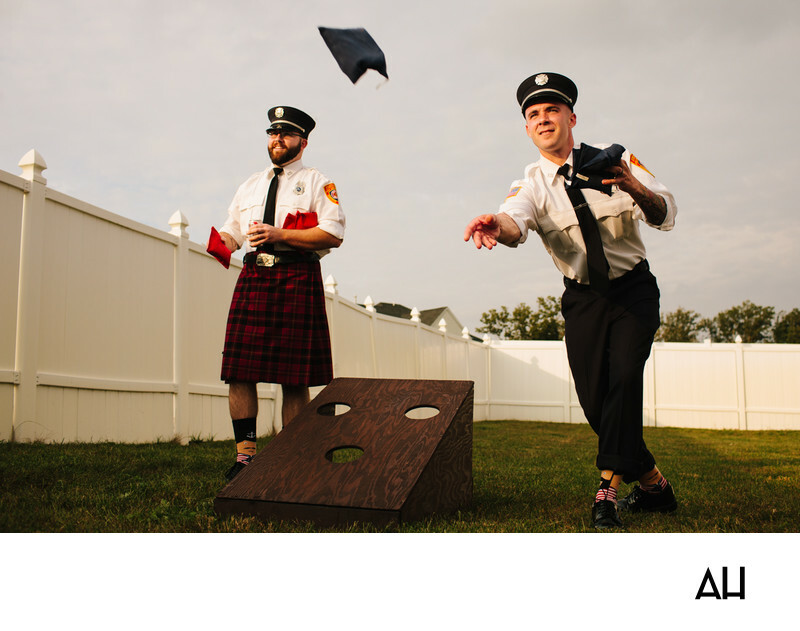 As a Backyard Wedding Photographer NJ, I captured the image of these two groomsmen playing a classic New Jersey tailgating game, repurposed for the wedding festivities. The game is not one that you would typically find at a formal wedding venue and is unique to this couple’s more casual backyard gala. The game being played is corn hole, though depending on where one is from, it could be referred to by a different name. The game consists of two slanted planks that sit opposing each other, each with three holes cut into the wood. The object is for the players to toss bean bags into the holes to score a set amount of points. The game is a staple for the newlyweds and their friends, and is played at most barbecues and other outdoor gatherings. That is why the couple determined that the game should definitely be a source of entertainment for their backyard wedding reception. The two men pictured are firemen, as is the groom. The groom and those of his groomsmen who also serve as professional firefighters wore their uniform shirts and hats. The groomsmen pictured look regal in their uniform attire, but they have no problem basking in the fun, carefree atmosphere of the day.